/Home/Is It Allowable to Smoke While Taking Birth Control Pills? Is It Allowable to Smoke While Taking Birth Control Pills? It is better to refuse smoking while taking birth control pills. Smoking, as it is, is harmful to health. And in combination with taking estrogen-containing contraceptive pills, the harmful effect of nicotine increases several times. the movement of blood through the vessels and veins is difficult. the movement of blood through the vessels and veins is hindered. Therefore, if your age is more than 35 years and you get at least one point from this list, then you need to choose a contraceptive that does not contain estrogen. A smoking woman should understand that even the most minimal dose of estrogen contained in the drug increases the coagulability of the blood. In no case do not listen to the advice of “well-wishers” that modern micro-dosed birth control pills can be taken without risk to health. Smoking women can take contraceptive pills without estrogen (the so-called gestational pills or mini-pills). These drugs also reliably protect against unwanted pregnancy, but they have an unpleasant disadvantage. Purely gestagenic drugs, in contrast to combined, cannot completely control the menstrual cycle and when applied breakthrough bleeding can be observed. These bleedings are not harmful to health but can cause some discomfort. 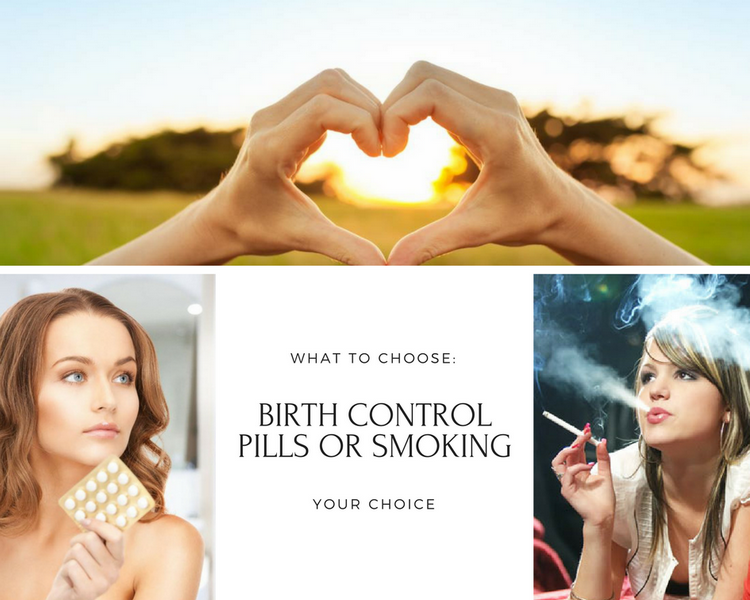 Therefore, it is necessary to stress out: either tolerate breakthrough bleeding or quit smoking and turn to more convenient combined birth control pills. There are other ways of hormonal contraception for women who smoke – IUD, which is installed in the uterine cavity for a period of 5 years. There is one more method hormonal implant injected under the skin. It provides reliable contraception for up to 3 years. With irregular sexual life, you can use non-hormonal contraceptives: birth control pills or creams, a regular intrauterine device or a condom. There is an issue whether it is possible to use combined contraceptive pills with estrogen if the woman is less than 35 years old and she does not smoke very much. In such a situation, it is possible, but before starting to use it is desirable to undergo a blood test for hereditary thrombophilia. if someone from close relatives had died at a young age from a stroke, a heart attack. In the process of taking birth control pills, a woman who smokes should take an annual test to check for blood coagulation. In order not to allow an increase in blood clotting, drink a sufficient amount of liquid (1.5 – 2 liters per day), especially in the heat weather. You can use onions, garlic, cherries, cranberries, blueberries and ginger to dilute the blood. Special drugs can be prescribed that dilute the blood on the doctor’s recommendation.